I love the Painting Challenge; I always have. 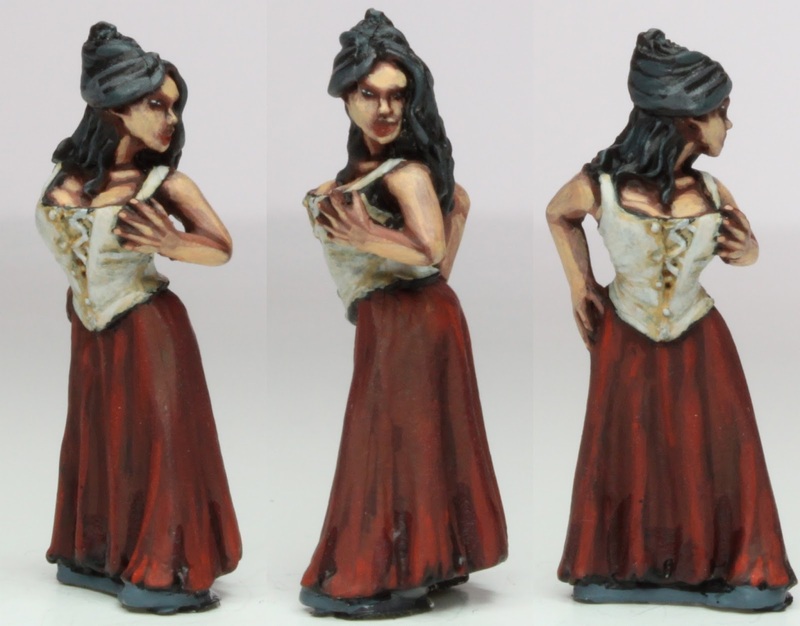 I love the the flexibility that allows us to push for the greatest tally of points, slug it out painting a particular era or my own particular favourite goal - putting something together that really tests my painting and modelling skills. 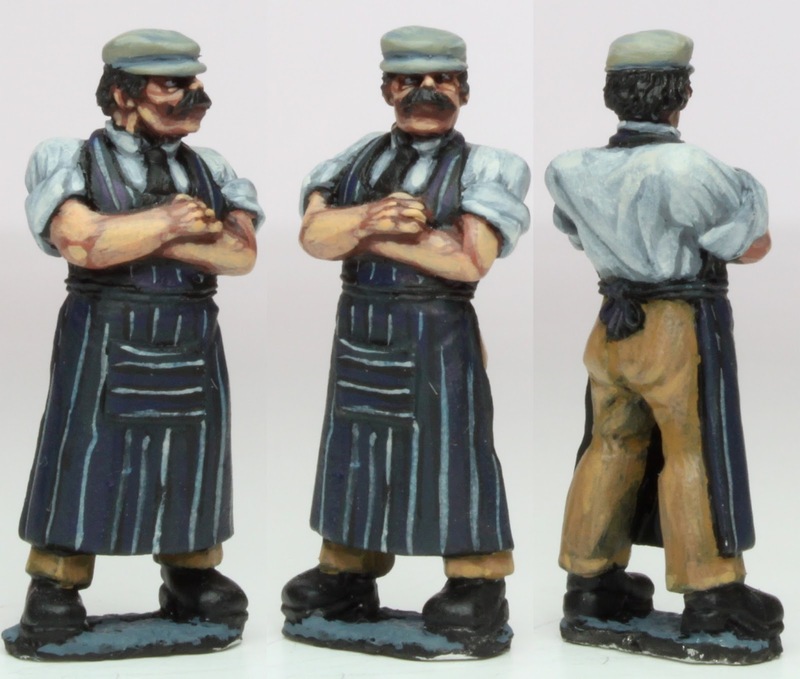 This then is my offering for the last category; in its simplest form this is an entry comprising of 4 x 28mm Foundry Victorian miniatures, one (the casualty) is prone whilst the fishmonger comes with his own market stall. Although I have been mulling over the concept for a good while now, the build itself started on the 21st January and has been quietly going on in the background, whilst I have tried to keep moving with other units. 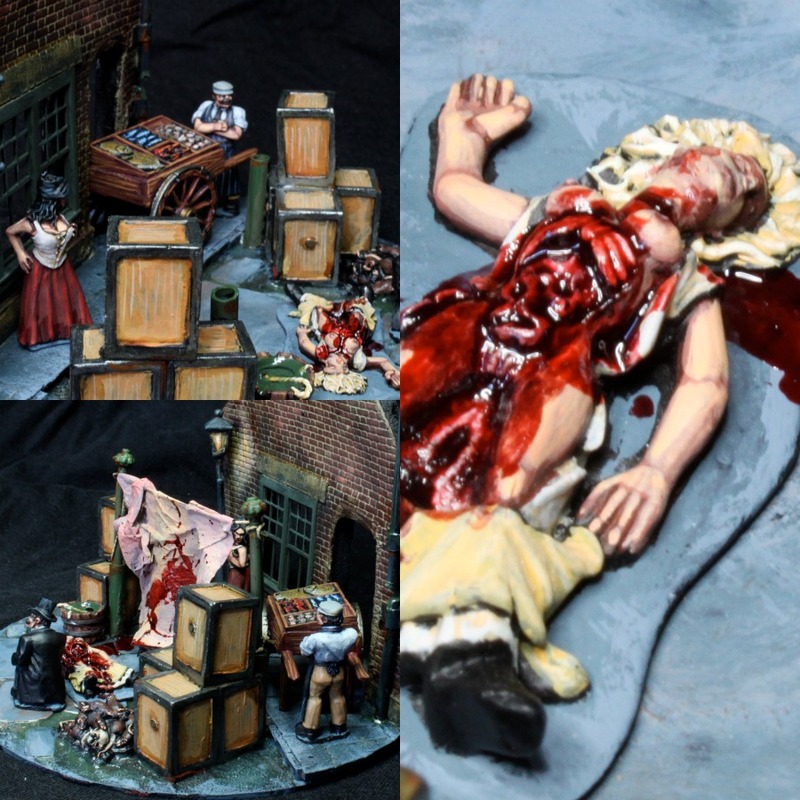 This is a scratch built vignette, inspired by the horrific events that took place in Whitechapel, then a squalid district in the East End of London, during the year of 1888. The mystery of Jack the Ripper and the grisly murders that are attributed to the killer still hold the public's imagination even to this day. That coupled with my love of all things 'Victorian' made this an obvious theme for the 'Casualty' round of the '4th Analogue Hobbies Painting Challenge'. The quality of the entries has proved to be exceptionally high, not to mention thought provoking; if you haven't had the opportunity to visit then I would encourage you to do so and take the time to cast a vote or two for your favourites. Whitechapel 1888… the build, follows shortly! Awesomely gruesome work Michael. This is one of my favourite entries for the casualty bonus round. Thank you Tamsin, that is incredibly kind of you to say so given the high quality of the other entries. Top class model making and painting. I do love the grim detail. It was always going to be about the gore with this one! Thank you Dave. Absolutely ripping ... errrr, stunning work, Michael. Quite stunning, especially as the backdrop is done from scratch. May I suggest these figures as being capable of catching that swell with the knife? Thank you Michael and inspired choice of miniatures! I may just have to have some of those. Absolutely amazing! The inspired scenery and top notch painting just makes this irresistible. I'm absolutely overwhelmed by this great vignette. Although there are many excellent entries in the bonus round yours is standing out. Stefan, that is incredibly kind of you to say so and I am delighted that we are both still managing to keep to our pledge! Michael, what an exceptional,and unnerving tour-de-force! I was bowled over when I say this entry. Very impressive indeed. I work in the City, and my office window looks over the same streets of Whitechapel. I always enjoy a walk down Commercial Street, and the 4D Model shop (where I get a lot of supplies) is off Lehman Street. Goulston Street and Dorset Street are not far away. So as soon as I saw this entry, it struck a chord with me. Great work, Sir! Thank you so much, there is no better praise than that from someone whose work you to appreciate - it means a great deal to me. I didn't know there was a model shop in the City! I must check it out! I HAD thought I had a chance of a showing in the casualty round but as you mention it's a fantastic crop and will have to be content to watch the best thrash it out between each other. Ian, I am humbled by your kind words, this really was a labour of love for me, so I am so grateful that it has been received so well. A bloody, beautiful work Michael...absolutly stunning! I'm struggling for adjectives - well done but a truly grisly topic. I think I'll go hug my wife after seeing these pics…. Thank you Peter, I felt the same when I was painting it and then again when I posted it - worrying that it might be too much. Wow ... I mean ... just wow ... did I say wow? ... I meant wow ... fantastic work. Very impressive Michael. I noticed the level of attention to detail in there, and some object source lighting on the wall. Amazing. Thank you Mike, this was just something that had to be done! Dude - I love your work - there is just sooooo much going on. Fab - u - lous ! Thank you so much, I feel a little spent, but still a couple more weeks to go! Thank you Dean, I loved every part of this, but the fish cart was a particular favourite to paint. Very gruesome, but still one awesome piece of work! Thank you Christopher, I was worried that it might be too much. Great Michael , i love it , great work ! WOW that look absolutely amazing Michael well done sir! Thank you, I really enjoyed experimenting with the lighting effects. Thank you kind Sir, much appreciated. A short story in a single vignette! Great modelmanship, Michael. The Doctor is back in town! Thank you Jay, good to be back with the brushes! Off the charts amazing, with your combo of killer painting and a big dose of scratch built. This got my vote. That is incredibly kind of you Monty, just thrilled with how it came out. Really magnificent diorama. As I said before, I really hope it gets the recognition it deserves! Thank you, I am bowled over with the support that it has received. Yikes, it looks like Jack is back on track. Was Jack a royal? Who is to say? Superb job, Sir Michael. Thank you Jan, as for his identity - will we ever know? Words fail me Michael - you've truly raised the bar with this one. I think I recognise the inspiration for the (still breathing) Lady of the Night - we should compare notes! I wonder who you might be thinking of? Thank you so much, your continued support is always gratefully received. What more can I say that hasn't already been said?????? THE entry of the whole Challenge!!! IF this doesn't win I'm gonna pack up painting figures!!!! Ray, that is incredibly kind of you! I am so thrilled with how well it has been received, really delighted. Thank you so much, but plenty of other wonderful pieces out there. Brilliant job Michael! - I may have to have a look at those foundry figures - I just wonder how well they will scale with the EotD rage from Westwind? Thank you Scott, I would imagine that Foundry ones are a little 'chunkier' but on the whole they should be fine. I have some of them. They work perfectly with EotD and I am really fussy about scale. One of my favourites for the round. You really should consider doing these vignettes on commission mate. As Michael's "Business Manager" I've be telling him that for a couple of years. 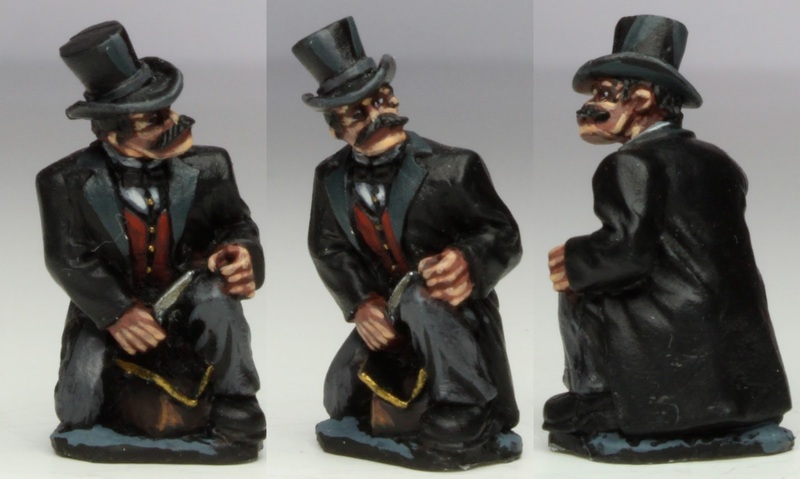 I think the lure of filthy lucre is outweighed by the pleasure he gets from simply creating wonderful figures. PS by Business Manager I actually mean sitting on the bar stool next to his! A role, I might add, that you have been in gross dereliction of recently! Thank you Millsy, by the way, but the PM is right - it's just not as much fun if you're painting for someone else. Simply fantastic! Its a good thing the fiend had that curtain to conceal him that fish monger looks to be a tough cookie. Tough he is, but he seems to only have eyes for the young lady! all the details are perfect for a inspired vignette ! Thank you so much Sam, much appreciated. Splendid old boy - so much great detail. I very impressed. Possibly your finest hour sir! That is one great little scene Michael …that clothesline is dead on. Thank you Captain, I'm sure the tissue paper was inspired by your own great work. Stunning, simply stunning. Excellent work sir. Thank you so much Bob. Ugh. Argh. I've winced at grisly scenes in films, and at gruesome passages in books but I'm pretty sure this is the first time I've felt really repulsed by a set of 28mm miniatures. You are breaking new ground, here. Great, Great work. Thank you, I think! I know what you mean though as it made me question whiter it was too much or not to post. I know it's all been said already BUT, absolutely awesome modelling and painting Michael! Rodger, I really appreciate that, thank you. An amazing vignette of the highest order sir. Fecking hell that's very impressive Michael! Thank you Francis, I really enjoyed putting this together. Very nice indeed. well nice is almost definitely the wrong word. but you know what I mean. Everything about this is exemplary but for some reason the thing I am most impressed with is that fishmonger's stall - the painting on the contents of that is simply staggering! Thank you so very much and I have to admit that the fishmonger's stall was one of my favourite pieces to do. I just loved picking out the details. It's a definitive piece of work Michael, one that pushes the boundaries. I'm both honoured and delighted that you debuted it in the Challenge. That is very kind of you Curt, but thank you after all it is your challenge that seems to be bringing out the best in all the participants. Excellent painting and I have to say, inspired work! Real horror, but fantastic work!